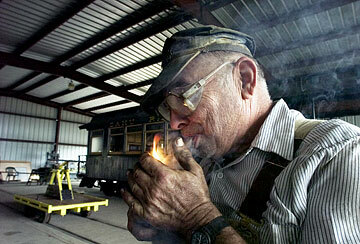 John De Yeso lit his cigar during a break yesterday at the Hawaii Railway Museum. De Yeso worked as a heavy equipment mechanic for 40 years and now volunteers his time at the Ewa museum, which offers rides on historic trains from Ewa to the Waianae Coast every Sunday at 1 and 3 p.m. The cost is $10 for adults and $7 for seniors and children. For information, call 681-5461.